Like many other observers and analysts, I responded to Amazon (s amzn) CEO Jeff Bezos’ acquisition of the Washington Post by jumping in with some free advice on a turnaround strategy — a list of five things I thought he should do to try and reimagine what a newspaper needs to be in a digital age. One of those suggestions in particular has triggered a barrage of criticism: namely, the idea that the Post should shut down its printing presses. But that is the step I think may actually be the most crucial — and at the same time, the hardest to take. The reason why it would be hard is partly financial. As Ryan Chittum has pointed out at the Columbia Journalism Review — and as others have pointed out to me on Twitter — there is a very real cost to shutting down the print version of a newspaper like the Post. According to Chittum’s calculations, the New York Times generates close to 75 percent of its revenue from print, and print readers also make up about 75 percent of the overall time spent with the NYT — because they spend more time with the paper version than readers do with the website. Based on its latest financial results, the Post generates about half of its revenue from print advertising and circulation — which is still a substantial amount. Of course, this kind of argument for keeping print ignores two crucial points: the first is that print advertising has been declining dramatically for the past decade or so, a free fall that shows no sign of slowing down, let alone stopping. The second is that printing also makes up a large part of a newspaper’s cost structure — and shedding print would also shed those costs. But let’s agree for now that if the Post were to stop printing, it would cost the company some revenue, and perhaps even a lot of revenue. In a way that’s irrelevant, because my argument for why Bezos should stop the presses isn’t primarily a financial one. I will say that I think Chittum’s observation about how an average New York Times reader online is “worth virtually nothing” says as much about the failure of the NYT to take advantage of those readers as it does about the inherent value of an online audience (and even former NYT statistics columnist Nate Silver is with me here, saying the Times should be far more profitable than it is, based on its traffic). But let’s leave that aside. Extreme risk-aversion is NOT a good mentality when revenues are declining, as at most newspaper brands. For me at least, the benefit of stopping the presses would be primarily psychological. That’s why I referred to venture investor Marc Andreessen’s advice from 2010 about how newspapers should “burn the boats” — which in turn was a reference to the apocryphal tale of the explorer Cortes, and how set his boats on fire so his troops wouldn’t be able to flee. In some ways, the fact that a newspaper’s print operations still make money is as much a crutch or an addiction as it is a help. Not only does it siphon resources — both personal and financial — away from the digital side, but it diverts attention as well. That’s a big part of why Digital First Media CEO John Paton is such a proponent of putting digital natives in charge instead of “printies.” It’s difficult to focus on disrupting an existing business when you are also trying to manage that business — that’s a big part of the innovator’s dilemma. Would shutting down the print version of the Post inconvenience a lot of readers? Sure it would, and probably advertisers too. But there are plenty of things Jeff Bezos and Amazon could do to ease that inevitable transition, like providing free (or heavily discounted) Kindles to any reader who wants them. Some critics argue that stopping print would affect lower-income readers most — but then aren’t newspapers already partway down that road anyway, by putting up print prices and implementing restrictive paywalls? The thing that makes a print shutdown most appealing is that it would make it obvious to everyone where the future of the Post (and other papers) lies, and it would focus every ounce of attention inside the paper on digital only — not on some wishy-washy blend of print and digital. And while I don’t have any more insight into Jeff Bezos’ motivation than anyone else, I think he would be attracted by the purity of such a move: Amazon is not one for half measures, and I hope he brings some of that approach to his stewardship of the Post. Mathew Ingram has experience in both print and online journalism but not on the business side of media. The article seems heavily informed by his personal transition from analog to digital and is lacking a crucial piece of analysis. How is the Times-Picayune doing in New Orleans since it went digital? That is a two-fold question. Of course we need to know the financial trends but we also need to know how it is fulfilling its journalistic role as a watchdog for its readers and the community at large. If the move to digital has cost it vigilance and influence, then there is a loss that cannot be measured in the financial statements. Here is a suggestion for the interim period. 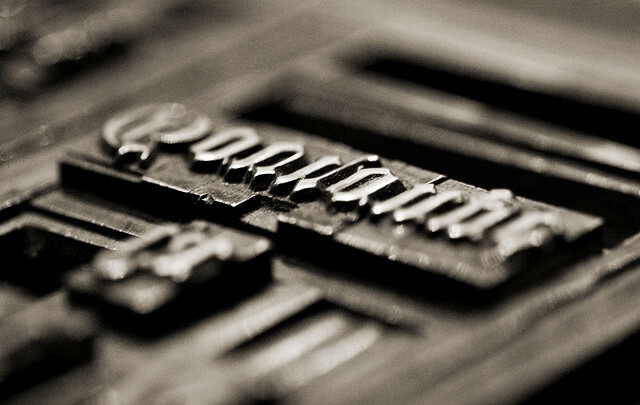 The printing press may be turned into a separate company to do commercial printing round the clock. The Washington Post may pay only the printing cost of the print copies. That will save it printing cost while the new company will make money by serving other customers. I am guessing Mathew has never worked at a newspaper as you can not just flip a switch on a MAJOR newspaper like the Post without committing suicide. I dont have time to go into detail but Mathew has no clue on what would happen POST (no pun intended) going printless! Very bad idea, and good thing it is one mans very uneducated opinion………. Everyone is missing the point. You can keep the print version if the cash flow is sufficient. Capital has to continually be invested in the printing operations, much more than the labor being deployed to write/report the news. If it’s declining you can still run it off – think of an insurance company no longer writing policies. It still generates cash for a long time. If the cash flow profile is headed in negative direction quickly shut it down. In the meanwhile the business has already gone digital and will continue that direction. The Wall St Journal is a good example of how to run a digital business that people actually pay to use online. Standard newspaper to web conversions have been failures for most newspapers. Even a digital version, though, is going to be difficult to manage for growth, as the internet along with other media channels continues to disintermediate the industry. For those who don’t believe the newspaper isn’t read online wake up – its read on iphones/tablets/computers and has been for years and is now accelerating. Plenty of 35+ people including myself have passed on print newspapers for years. The so-called 35+ business model is there if there are profits otherwise no need to cater to a crowd that doesn’t adapt. Just look at how many newspapers are delivered on your street – none! Other mediums are also now coming under pressure from the same forces impacting newspapers – Cable TV and broadcast TV, radio for example. The missing link? Advertisers are still reluctant to spend equivalent dollars for online advertising they spend for print. Online advertising cannot support the (admittedly less-expensive) infrastructure necessary to support a first-class news gathering organization. The Post and all other print organizations that bail out and choose online content and advertising as their salvation are nothing more or less than competitors with the likes of Facebook, Twitter, Huffington Post, and Politico. Go ahead and shut down the presses, then watch the revenue stream dry up to a trickle. Ha, ha, ha, ha. After reading this article I don’t have to worry about reading anything else on GigaOM. Kind of reminds of Rush Limbaugh. Fear mongering and no facts. Start offering a free no-frills reader tablet if you subscribe for, say, three years, Treat it like cell companies treat handsets. Offer access to all the content the paper has ever produced. If you want to, develop more fancier reader models (and charge more). But the basic structure of the subscription/device combo deal is pretty simple. online content free except for a few in-depth articles which could be paid for. All news could be free as it can be got elsewhere. There’s an alternative to what you’re proposing. That would be to create a separate print arm that aggregates whatever Washington Post journalists produced in the prior 24 hours as well as the best/most important information from news wires and package that content for print. 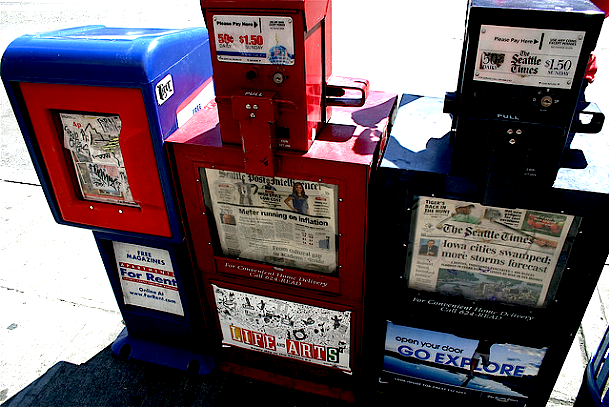 Instead of repurposing for the web, newspapers should be repurposing web content for print. At least in almost all cases. This way readers who want a packaged, limited-size news report can get one and advertisers can continue to use the strengths of print as a medium. This would also allow the print arm to become more entrepreneurial, because we know there is much potential in commemorative-type publications as well as other special publications, even possibly smaller community-sized publications that would serve local advertisers. The job of journalists would be clear. It wouldn’t be to meet print deadlines. It would be more along the lines of what Kara Swisher described in her letter to Jeff Bezos. This is the New Orleans model. If you’re going to do it, be prepared to commit to it in the face of criticism. I disagree. There is a place for print. Just not in its current form. When I was working in London, I noticed that there were a couple of brief, free, local newspapers that many people would read on the subway. These “newspapers” were perhaps 8 pages tops. No article was more than a few paragraphs. It was a brief news, business, sports, and entertainment summary designed to be consumed on your subway commute. It dawned on me that this would be a perfect solution for the failing fat US style daily newspaper. Have the WaPo print a short 6 page highlight edition of their paper that they give away for free (or dirt cheap.. a nickle) to commuters. Readers who want a more in depth article can go read it on the website at work or at home. In other words, the print edition becomes a teaser ad for the website. And because this brief edition would be so small, they could print and distribute them in other markets outside of DC. Wouldn’t that be cool if you could pick it up on your morning coffee stop? What about the middle-class consumer? The one who buys the paper for coupons, recipes, knowledge? As a middle-class consumer who just this year bought an apple mini, I wouldn’t like to read much more than a magazine on this thing. It is just to small. What you are forgetting is that the middle class and lower class can’t afford a lot of things right now. You then break up the market further by having the knowledgeable because they can afford the latest gadget and the uninformed, unable to keep informed because they can’t afford the technology? Paying $1.50 four times a month for the Sunday version is doable. Also you are depending upon technology that is still not hit all the country. I live in Maryland, in a “wealthy” area but can only afford dial-up access. There is no cable, no FIOS, and satellite is not guaranteed. Full disclosure, I work in the print industry and I saved up to buy the mini not because I truly wanted one but because I can’t afford a tricked-out or even tricked laptop. Too expensive. Ideally, all of the America-hating communist liberal democrat marxist rags should simply be shut down completely. Let’s see, the newspaper will lose revenue and readers, readers will spend less time reading the paper and have to go online to read, even if they don’t have access to a computer or reader. And this is supposed to be a recipe for success? How self-serving for a web produced media outlet to publish such drivel, and how unaware of the lives of newspaper’s customers. Agreed, this is the direction but there are a lot of people who still want print,, especially the older 35 + crowd. There has to be a model which includes those readers. Why would anyone shut down the most important revenue source of the company even in a declining trend? That doesn’t make any sense. The real challenge is to preserve the print business as much as possible while making big and profitable the digital one. Interesting article. Out of the box conceptual thinking. Possibly apply the same thinking to other industries? Attempting to protect jobs in dying industries instead of thinking on how to re-train/re-educate workers is why we are in the current jobs situation. Uhm, while I agree with you, thatâ€™s not far off either. Cable TV companies are struggling and internet services like HULU are taking off. Soon, there wonâ€™t be any cable TV. Really? You actually think that everyone has some sort of capability or desire to “read” a newspaper online? This is the most ridiculous suggestion I’ve ever heard, and I’ve been around for many decades and most of them in the IT world. Not everyone subscribes to the idea of being connected 24/7 and a lot of us don’t care to read the news on a screen not much bigger than the palm of our hand. I see this as an arrogant, short-sighted suggestion that might make sense to the internet addicts, but to people who know better, it’s pretty lame. What’s next – having television stations scrap their broadcasting equipment so everyone can watch TV on their idiotic iPhones? The newspaper industry still provides much needed jobs. 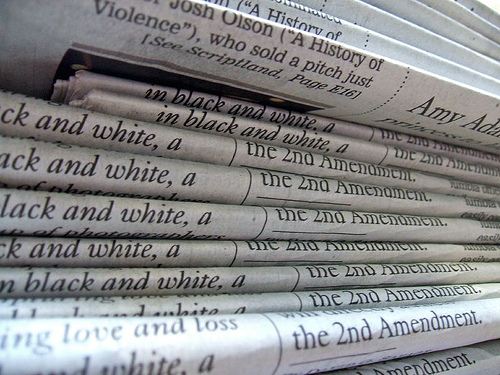 Besides journalists, printed newspapers require production, sales and circulation. The last thing this country needs is more unemployed professionals. They can offer free access to washtington post on kindle! So any one wants to read the paper on the move, have to bue kindle! The benifits are dual fold! Killing print just for the sake of killing print isn’t a solution. And the online-only future is no heaven either. Good journalism isn’t cheap and thus far it can’t be sustained by an online operation alone. Without its print operations WP will ultimately fail into a mix of good stories and “popular” content that would destroy it. Just look at Newsweek. You seem to assume Bezos bought the WaPo to make money from it directly. But as Alex Pareene remarked, “The rich don’t buy newspapers to…make money. They buy them to get influence.” (http://bit.ly/13XYqgz) The WaPo considered in isolation could be a steady loser yet still be a winner in the larger context of the Bezos empire, provided it retains its cachet with The People Who Matter in DC and sways them toward tax, labor, and other policies that make money for Amazon. From this perspective, the question about the print edition is whether digital-only would be as effective at reaching those people. I don’t know the answer to that question, but I note that those people have a tendency to be old. What percentage of the Post’s costs can be attributed to print? Without a number to compare to 75% of revenue, how should we evaluate your advice here?